The City Theatre’s catering facilities have undergone a complete metamorphosis on the inside: warm, hip and modern. 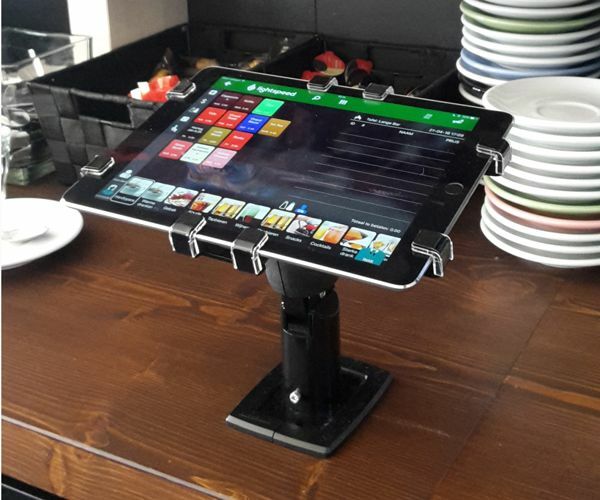 In collaboration with Amsterdam-based company Retail-Tec, Rembrandt chose the most modern techniques for its point of sale system, such as tablets in the cloud based on Lightspeed Restaurant. Lightspeed is a cloud-based point of sale system for use on tablets, smartphones and iPod touch. Lightspeed also has an offline mode, so organisations can keep running smoothly, even though the internet is down. Employees can use it to easily take orders and payments without cash. It is not recommended to leave a tablet unguarded in a semi-public space. A good tablet enclosure is needed to keep the tablet safe and prevent theft. It is just as important that the tablet can be easily locked and unlocked for mobile use. Rembrandt en Retail-Tec chose Gripzo’s tablet enclosures. These specially developed enclosures offer top-notch theft prevention, while at the same time providing an easy unlocking process by means of a security key. Gripzo tablet enclosures are patented point of sale fixtures, developed and made in the Netherlands. They are used throughout the world, from the United States to the United Kingdom and Australia. One thing remains the same: tablet theft is reduced to zero everywhere. Gripzo offers enclosures for Apple and Android tablets and uses the ‘one size fits all’ principle: one set of enclosures can be adapted to every format. The tablet enclosures can be placed and locked in only three seconds. Unlocking is just as easy and also takes three seconds. Theft prevention by Gripzo is suitable for tablets used in (semi-)public spaces, trade fairs, expositions, point of sale environments and offices. Gripzo does not only offer enclosures for keeping tablets secure, but also to prevent mobile phone theft. The same principle applies: safety, ease of use and zero theft.